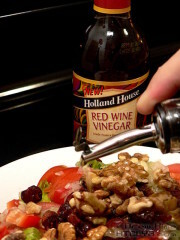 Once upon a time I thought “vinaigrette” meant oil and vinegar. Close, but not exactly. And back when I thought that, I thought “oil and vinegar” meant Wesson vegetable oil and distilled white vinegar. Needless to say, I couldn’t understand why anyone would want to use that on their salad. Then I discovered olive oil. 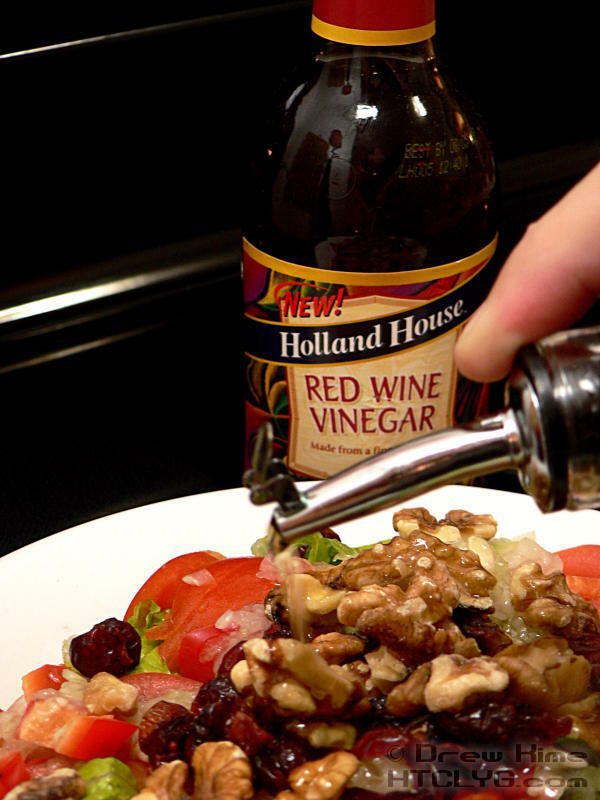 And balsamic vinegar. Ooohhhh … that’s why people like it. I started with a pretty basic salad so I could really taste the dressing: Romaine lettuce, shredded cucumber*, tomatoes, walnuts and dried cranberries (AKA Craisins™). I figured the cranberries were already pretty sweet, so I didn’t want to go with my usual balsamic vinegar. * The shredded cuke was Jenn’s idea. 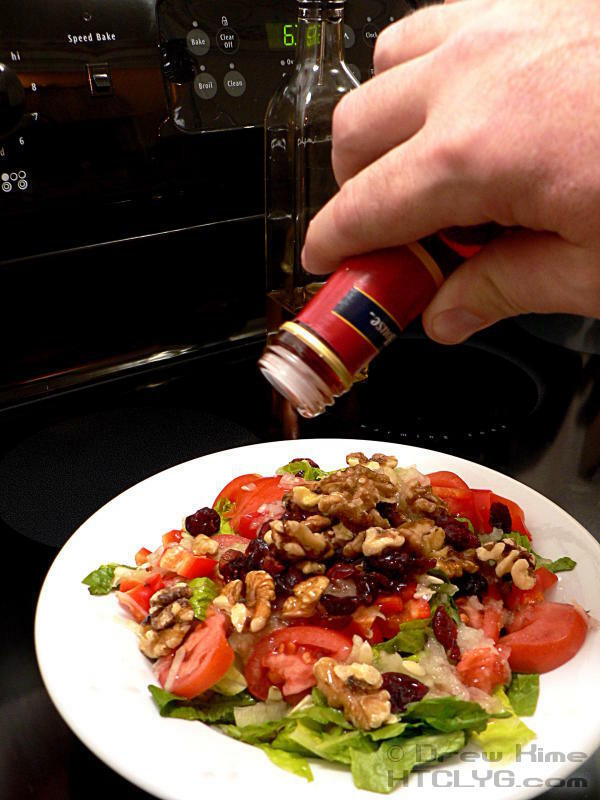 I’ve never seen anyone do that before, and it really makes for a nice change of pace on a salad. That meant it was down to white wine vinegar or red wine vinegar. I sampled each on a plain lettuce leaf, and the white was very mild. As in, “Is there any flavor at all to that?” mild. So I went with the red wine vinegar. This is a winner. 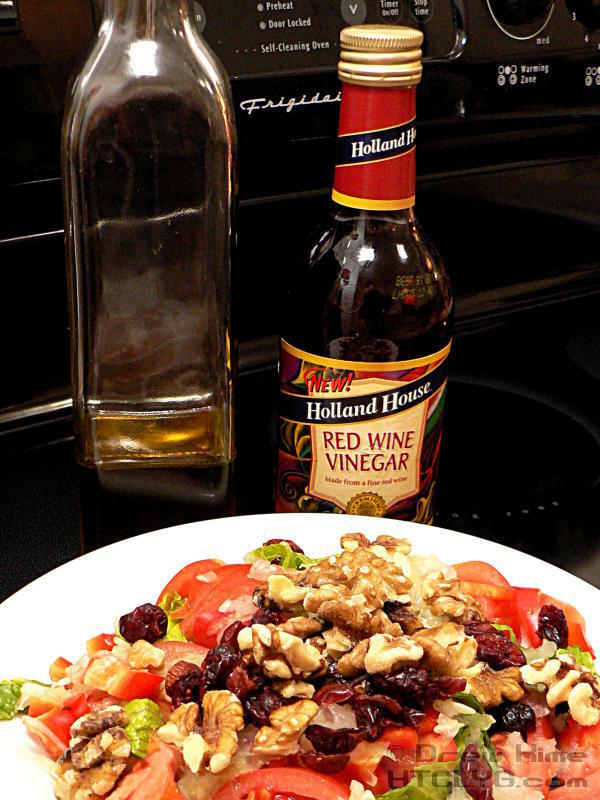 Less sweet than balsamic for when you’ve already got something sweet in the salad itself. This is going to work really well on Greek salad, maybe one with mandarin oranges and/or strawberries. Mizkan also makes a version of the red wine vinegar with garlic flavor already in it. I can’t remember the last time I didn’t have garlic in the pantry if I wanted some, so I’ll stick to the single ingredients and mix them myself. If I ate salads every day for lunch though, I’d give it a try. I could keep it in the desk a lot easier than I could keep the plain vinegar plus a head of garlic. Well … not true. I could keep the garlic just fine. But no one would want to talk to me in the afternoon. Not that that’s a bad thing.